I built this 1954 Harley Davidson K scooter back in 1969, one of the first "choppers" I'd ever done, and on a really limited budget (I was a teenager then). Picked it up as a "basket case" we found laying around in the back of the late Stan Dishong's Harley shop in Vallejo CA, and thanks to some help and moral support from Jerry Collins (then - Collins Cycles in Napa CA) I got her all put together and on the road. I sold it not long after this pic was taken and went on to build others, but this was one of my all time favorites. People talk about "Old School" these days, well, here's one of the originals. 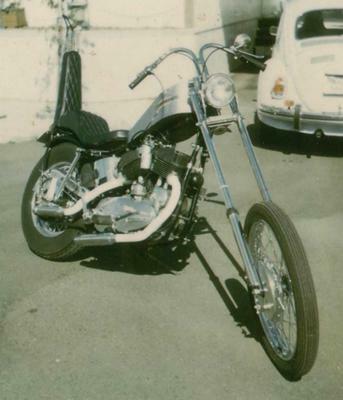 The tank is a fiberglass "coffin" style, and we strutted the rear and stretched the forks 10" to get the low, stretched look that was common back in The Day. Very cool sled man!!! They don't make em like that much these days!! !